Neil Tennant and Chris Lowe are ready for The Love Boat. As the Pet Shop Boys, the two have even written a song for the outing. Or at least, ”Requiem in Denim and Leopardskin” echoes 1979’s ”Love Boat Theme,” right down to the cheesy ’70s-era synths. 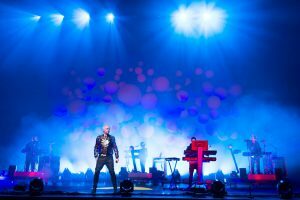 And any potential passenger, beware: You’ll do a lot more sleeping than partying on a Pet Shop Boys cruise – if Elysium, the band’s 11th studio set, is any guide. In fact, it’s another nail in the coffin, another argument for Tennant and Lowe just sailing away, never to return to pop land. (As the last track ”Requiem…” even suggests, Elysium could be the Boys’ swan song – ”our last chance for goodbye,” as Tennant puts it.) Oh yes, Elysium is that bad. Far more than 2009’s desultory Yes – or 2002’s Release – the Boys, working together for 32 years now, sound almost totally out of ideas. Actually, they’re not, a fact they prove on new song ”A Certain Je Ne Sais Quoi,” the lively electro-pop ditty not included on Elysium but simply as the B-side to the album’s first single. By contrast, that first single, ”Winner,” is the bland, barely winning ballad far more notable for its trans-positive video featuring the London Rollergirls and its transgendered rookie Dirty Diana. There are momentary glimmers of hope on Elysium, from the dazzling electronic flourishes of ”Everything Means Something’ to the sass and sarcasm of ”Ego Music.” But no track stands strong all on its own, much less up to the duo’s pioneering post-disco pop classics such as ”West End Girls,” ”It’s A Sin” and ”Always On My Mind.” Album-opener and current single ”Leaving” may be the most accomplished song here, a simmering synth tune about a couple’s dying love that also perfectly captures the immediate predicament of a long-suffering Pet Shop Boys fan. ”Our love is dead,” Tennant sings, before his despondent words are seconded by a choir. It’s something of a sad corollary to the choir that chants happy, early-love expressions on ”Go West,” the duo’s wondrous 1993 Village People cover. ”I can still find some hope to believe in love,” Tennant further sings on ”Leaving.” But the joyless Elysium makes the prospect of a listener finding some hope exceedingly difficult. The duo inexplicably aimed to shake things up with this album, its first recorded in the U.S. – and its first with producer Andrew Dawson, who has heretofore chiefly worked as an engineer – not a producer – on albums for Kanye West and Jay-Z. It boggles the mind why they didn’t opt to work with überproducer Stuart Price, the man responsible for the band’s perfectly realized 2009 tour, not to mention his work producing standout albums by everyone from Madonna to the Scissor Sisters. Sadly, he speaks the truth. WHILE THE PET SHOP BOYS SAIL AWAY to a state of irrelevant torpor, Bob Mould sounds more invigorated than he has in a decade, or more. In fact, as Mould explains in an interview with Metro Weekly, Silver Age was intended as a companion to Copper Blue, his record-selling, 20-year-old debut with the power-pop band Sugar. The blistering, bewitching new set starts out with the hard-charging, guitar rocker ”Star Machine,” and only really lightens up a few momentary times in 38 minutes. ”Never too old to contain my rage,” the pioneering post-punk rocker sings on the full-throttle title track, which features Jason Narducy’s thundering bass guitar work that recalls Nirvana, just one of many bands that Mould – in Sugar or in his original band Husker Du – influenced. But Mould’s rage here is expressed mostly through the music, not the lyrics. After a couple introspective albums, including 2009’s brilliant Life and Times, as well as his autobiography, Mould decided to keep his Silver Age lyrical focus mostly just on the surface, without delving too deep into his life or observations. First single ”The Descent” focuses on a protagonist whose ”descent has now begun, all the music left undone. My world, it is descending.” But in truth, musically this is Mould at his most melodic and angular, as well as cathartic; it’s nothing if not ascendant.